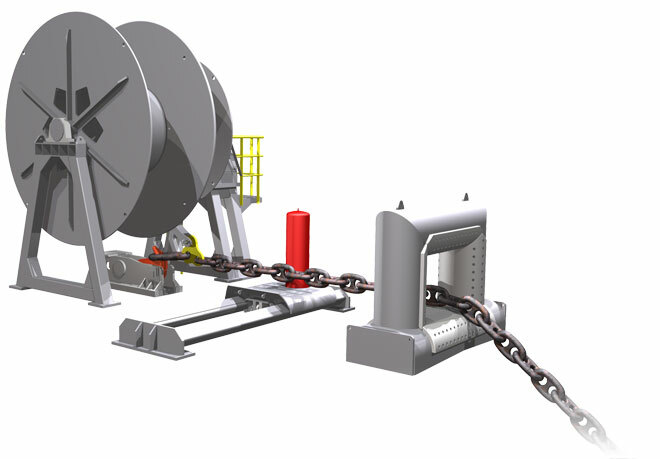 Techflow Marine Tandem Mooring Systems provide safe and efficient tandem mooring operations between FPSO and Shuttle Tankers. The systems provide a means for storage, deployment and recovery of the Mooring Hawser/Chafe Chain/Messenger Line Assembly and Integrated Mooring Point, with full load quick release facility. In addition, hydraulic power/control utility and load monitoring/data logging equipment can be incorporated. Various systems are available, specifically configured and designed to suit individual applications and installations worldwide. The Tandem Mooring Systems can complement our range of Fluid Transfer Systems utilising common power and control arrangements. Techflow Marine provides comprehensive and fully integrated systems with reliable and simple operation. Systems are tailored to meet specific client requirements.